The deadline is when Update 49 comes out which doesn't have a release date yet. Attention, all Dalek Mod Players! As you may know, if you're in touch with the SWD discord, the TARDIS is getting a beauty overhaul for update 49. Currently, Ed has finished with most exteriors, but you may find that some exteriors also could use with a redo.This is where you come in! For the first time, we're announcing an interior building contest, here's how you can enter. Create a SUPER FLAT world in creative mode. Build the interior with maximum dimensions of 120x120 in width. Provide the coordinates from f3 screen to find interior when sending it. Compress the world file in .minecraft/saves and upload it somewhere like dropbox or google drive. Provide link to download it on application. Nor anything that may be used for easy access to rare materials in the construction of the interior, it will be replaced otherwise. Do NOT exceed 120x120 in width of construction as that is the max size for interiors. If applying for canon Doctor who interiors, PLEASE make them as accurate as you can. you may make corridors and rooms as long as you don't exceed the max boundaries, if you do, build upwards or downwards. you may add up to 4 new blocks (use resource packs and provide download for them if you do) to help you build the interior. you may model a custom handbrake, monitor and rotor for the interior as long as you provide model files. Something that also concerns me is that some people might try just making a custom interior to have it added in, but that's now the purpose of this contest. If you're building an Interior, be sure that it matches what the exterior is trying to convey, or it's appearance, if in doubt, just look at the current interior being used in the mod and modify it to look better. If an Interior is not already added to an exterior you're trying to build for, then you can be a little more creative, just make sure that it matches the exterior in style. You can NOT build an interior for these. Can I even add my CUSTOM TARDIS in????? Despite the negativity in this post, Yes! you have a chance to get YOUR OWN CUSTOM INTERIOR AND EXTERIOR INTO THE MOD, All you have to do is HAVE A MODEL FOR THE EXTERIOR READY, and apply with a download link for that as well, along with the name for the TARDIS. BUT I WILL ONLY CHOOSE ONE FOR UPDATE 49. How many Interiors can I post? You can post as many Interiors as you want, BUT, only one can be custom, the rest has to follow the rest of the contest's rules, such as needing to fit the exteriors. It'd be extremely helpful if you applied for an interior no one has done yet, not only it increases your chances of getting it in the mod but it'd also save up so much of my time as I wouldn't have to delay the update more due to having to update interiors. GOOD LUCK EVERYONE WHO ENTERS! What is the deadline for the contest? I have an interior but it has 4 steel blocks in it which is part of the design because it is a part of the color scheme, would that disqualify it? Do I have to build this in the Tardis Dim or can I build it in the Overworld? So.. if i want to participate with one of my interiors of dmu i will need replicate it in a flat world right?? or exist the possibility to copy from dmu beta?? 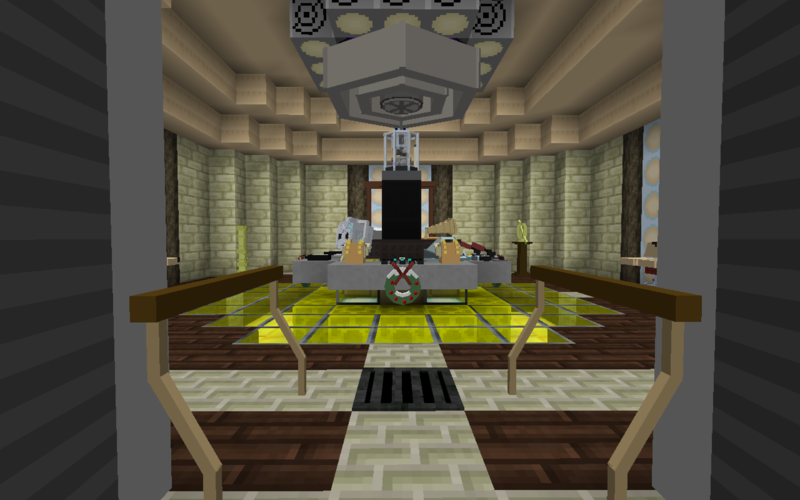 A TARDIS I made not that long ago, because I was just having fun. Thats why I posted so fast. The floor under the glass is classic gold. So it cannot be used. Can we upload more than one? IF anyone wishes to put the download link on the forums, I would be more than happy to give my thoughts. Are we also be allowed to model other custom blocks, like roundels or doors?